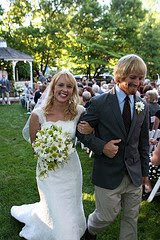 Blog Casual and Cute Summer Wedding! Casual and Cute Summer Wedding! 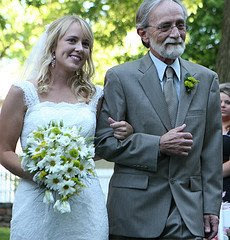 Here are some great pictures submitted by the Mother of the Bride of the wedding of Janelle and Phil. 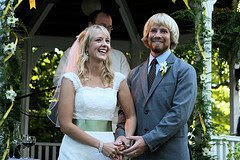 They were married on June 14th at Mudds Grove. Casual and fun was the style for this cute couple! The bride and her maids. 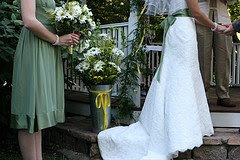 The Bridesmaids carried bouquets of daisies, lisianthus, green kermit poms, and yellow and purple filler. 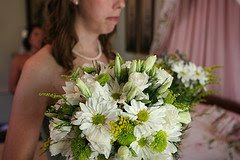 The bride chose white daisies, green kermit poms, and yellow filler arranged in a cascade style bouquet. 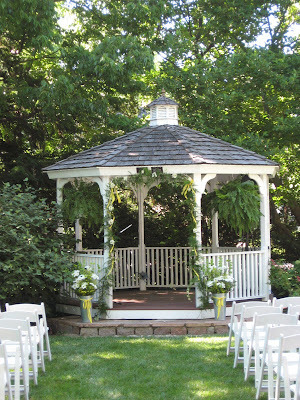 The Bride and Groom got married under the gazebo in the garden. 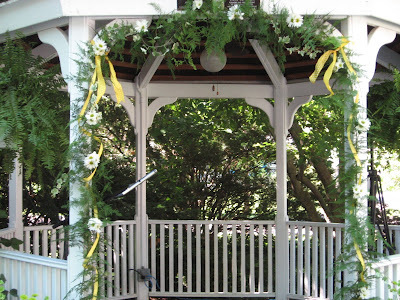 We decorated the gazebo with a garland of daisies and yellow ribbon. Two tall arrangements in silver buckets framed the couple. 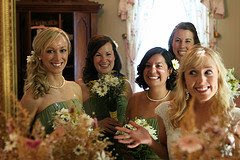 The guys wore simple, white daisy boutonnieres to complement the ladies’ flowers. 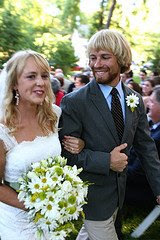 Our best wishes to the married couple! It was a pleasure helping you with your special day!